This is a completely independent review of WowWee's latest robot pet -- the RoboReptile. I am not associated with WowWee in any form, and I purchased the RoboReptile reviewed here for full retail at my local Target store. As you will see, we also own a RoboRaptor. Is RoboReptile that much better than RoboRaptor? Is it worth upgrading to RoboReptile if you already have a RoboRaptor? Is it best just to wait and see what WowWee comes up with next year? Read on to find out. OK... Someplace in China there is a guy with a tape gun and a wire twister. If I ever find him I am liable to end up with assault charges. RoboReptile is not packaged any differently than any other toy this size, but they sure make it hard to free your new robotic pet. After removing the outer box, there is the plastic cover, and then nearly a dozen taped and wired-in bits to be un-done. Where are the packaging environmentalists when you need them? I feel like I just made a contribution to the Enlarge the Landfills Society. There is also a potentially more serious problem in freeing your RoboReptile from the packaging. RoboReptile's feet are held to the packaging by several plastic pieces and 2 screws. These screws are in deep recesses in a plastic piece on the bottom of the inner cardboard box. I was not able to reach these screws with my Leatherman tool, and had to use a long screw driver. 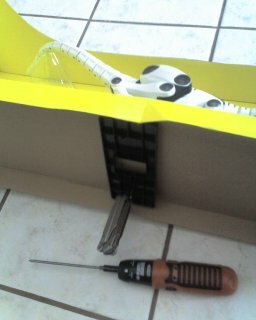 Too large a screwdriver will not fit into the holes, and too small a screwdriver may strip the screw heads. For obvious reasons, they do not use aerospace grade hardened metals for packaging screws. If you mess up the heads of the screws, freeing your RoboReptile without damage is going to be very difficult indeed. 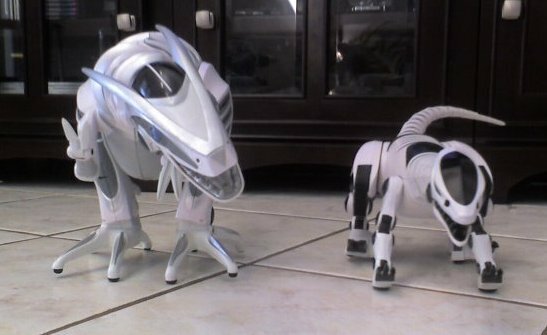 RoboReptile is Smaller than his Older Brother, RoboRaptor. RoboReptile is, in many ways, a completely different design than the earlier RoboRaptor. The two robots walk in completely different manners. The older RoboRaptor walks on two legs, and his tail and forelimbs never touch the ground. RoboReptile, on the other hand is always supported on at least 3 points. In his normal walk, RoboReptile puts his forelimbs rigidly on the ground, and skates along on the hard pads on the bottom of these forelimbs -- You know -- exactly like animals do not. The hind legs do the pushing and have rubbery pads that provide excellent traction on the tile floor seen in the pictures. Carpet of any notable thickness slows RoboReptile significantly. This concept of having at least 3 points on the ground at all times eliminates most possibility of falling over, so RoboReptile can move much more quickly than RoboRaptor. When RoboReptile goes off in Roam mode, he can transverse a fair sized room in seconds. RoboReptile can also rear up on his hind legs and tail. Again, 3 points of contact are maintained, and RoboReptile uses additional pads on his heals to shuffle along. Even this mode is much faster than any of RoboRaptor's gaits. This shows the difference in design of the 2 Robot's feet. The older RoboRaptor's feet are wide enough so that he can balance, at least momentarily on a single foot. RoboReptile, on the other hand does not need this. RoboReptile also lacks the "distended belly" of RoboRaptor. 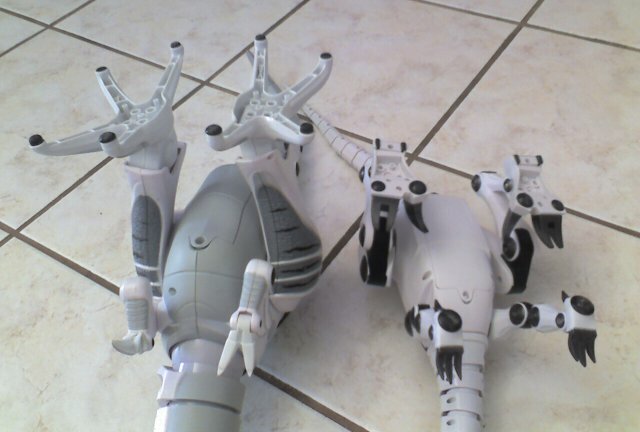 It is important to note that, like RoboRaptor, RoboReptile's hind legs do not articulate at any point except the hip. What appear to be multiple hinge points are in fact just the shape and coloration of the plastic. Since RoboReptile uses his forelimbs for support, they are rigid. Again what are made to look like multiple hinge points are in fact not. I would also like to point out that advertising I have seen states or implies that RoboReptile can "Leap" or "Jump". When RoboReptile transitions from being on his hind legs, back to being on all fours, there is a sudden forward movement, but at no time have I seen anything I would call a "Leap" or "Jump". This 'bot ain't leaving the ground without a swift kick (that is not a recommendation.) In my opinion, the advertising, combined with the false hinge points on the legs intentionally creates a misleading impression of the toy's capabilities. As a technicality, a reptile's legs stick out to the side, not down, so WowWee gains no score for accuracy with the name of this 'bot. RoboReptile's hind legs do not articulate at any point except the hip. What appear to be multiple hinge points are in fact just the shape and coloration of the plastic. In addition to the significant mobility increase, another area of improvement is RoboReptile's tail. It is much longer (proportionally), and has many more segments. This gives it a more life-like look, and when RoboReptile wiggles it's tail, it sets up a cool "S" pattern. RoboReptile's Head, Mouth and Teeth are much smaller than RoboRaptor's. RoboReptile lacks the sensor on the roof of the mouth that RoboRaptor had. RoboReptile cannot play tug-o-war like RoboRaptor could. Given the fact that any attempt at actually playing tug-o-war with RoboRaptor simply ended up with RoboRaptor either simply loosing, or tumbling over, this "feature" is not much missed. The Remote control has one "large" problem. The "large" problem is that it is large. While fine for an adult's hands, It is too large for a small child to easily hold and operate. 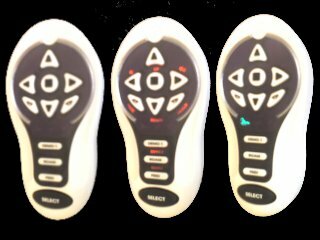 In addition to the size, the remotes for both RoboReptile, and RoboRaptor have the left and right turn buttons backwards. Since the 'bot's sensors are in it's nose, and it does not "see" well to the rear, WowWee assumes that the 'bot is facing the operator. If you press left, for example, the robot will turn to your left -- His right. Other remote control toys do not work that way. I fear that this will confuse young users that are just learning how to operate R/C cars, etc. Those 2 complaints aside, the remote is easy to understand. The remote has 3 modes, or "Layers" as WowWee calls them. In Layer 2, red symbols illuminate, indicating the second function of each key. Layer 3 is indicated only by 3 chasing symbols that illuminate green. It would be better to have symbols for each key in Level 3 too, but I understand why they did it the way they did. It is still better than some remotes on consumer electronics costing ten times as much. RoboReptile's predecessor had 2 Infrared (IR) sensors in his nostrils. The "eyes" were just plastic and paint. RoboReptile's eyes, on the other hand, are actually his eyes. Unfortunately, like his big brother, RoboReptile is quite near sighted, and runs right into most objects before turning away, or backing up. Given his long neck, and its swinging action, RoboReptile seems to like repeatedly smashing his head against walls and other objects. Also since objects must be very near to his head to be detected, RoboReptile cannot see low objects. He seemed to very often get stuck with his head under the sofa, between chairs and table legs, etc. Be warned that your expensive 'Bot friend will quite happily throw himself down a flight of stairs, possibly to his death. An additional set of sensors in the chest would eliminate some of these problems. More advanced (and to be fair, much more expensive) 'Bots have such chest sensors. Another method used to help utility and entertainment robots avoid getting stuck is to have current sensors on the motors. The Roomba robotic vacuums use this technique. I guess I am digressing into robotics theory, but the point is that RoboReptile's' roaming around a typical room usually ends in a matter of minutes with a stuck 'bot. RoboReptile getting stuck on certain obstacles. Both Robotic Dino's have stereo hearing. If you clap, snap you fingers loudly, or make a sharp noise both 'bots will turn their head toward the side of the sound. This is a cool effect, and adds to the illusion of an actual animal -- when it works. In the case of both of the products, they make so much noise moving, that the sound sensors are only active when the animal stops. Unfortunately, children are not likely to keep this technicality in mind, and end up yelling, slamming things, etc. to try to attract the thing's "attention". Noisy, roaring 'bot --> Children yelling at 'bot --> Parents with headaches --> Toy robot in trash bin. If (emphasis on "if") you time it right, either robot will turn toward the sound, and start moving that way. At this point we have an issue of limited attention spans. In the case of the old RoboRaptor, my attention span is going to run out long before he slowly shuffles the 2 feet to get to me. In the case of RoboReptile, it seems to be his attention span that runs out. After a short sprint toward the sound, he usually takes off in some completely random direction. I also noticed that RoboReptile seemed to have a little less sensitive hearing than his older brother. A better way to get RoboReptile to come toward you is to "feed" him. OK, this is about as abstract a concept of "Feed" as any sober person could come up with. "Feed" is simply a remote control code that will cause RoboReptile to come toward the remote. This feature replaces the "follow the light" mode of the earlier sibling. Be prepared to hold the "Feed" button down for quite a while. RoboReptile will slowly alternate between turning his body, and moving his head until he is pointed approximately at the remote. He will then take a few steps, stop and repeat. Given the choice between this totally un-fulfilling human - machine interaction, and having the blood flow return to my thumb, I release the button. RoboReptile makes chewing motions and munching sounds and, after a short delay, returns to his efforts to get his head stuck in the furniture. Interaction with the older RoboRaptor is not a specific feature of either 'bot. That said, the two Robosaurs do interact to a limited extent. Add to that the human perception of these 'bots as emulations of animals, and the illusion of interaction is even greater. RoboRaptor can definitely hear RoboReptile. When they are placed near each other, the larger RoboRaptor will turn his head toward the roaring and mechanical noises of RoboReptile. Each 'bot's IR sensors "see" the other's and perceives the other as an obstruction that appears much closer than it really is. Since moving is something that RoboRaptor is not really into, it is RoboReptile that runs off. 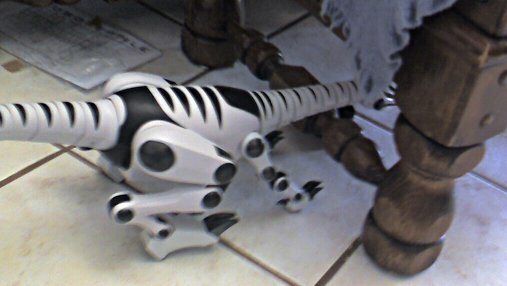 Interestingly, the only place RoboReptile cannot "see" RoboRaptor's IR nostrils is when he is behind RoboRaptor. This causes -- Uh -- Let's just say that RoboReptile often finds yet another place to get his head stuck. Easily embarrassed parents may find themselves with some difficult explaining to do. Clever parents can use this as a model for the business world. The interaction of the IR sensors really does cause this to happen more often than would happen by pure chance. RoboReptile has numerous other features. Mostly for fear of omission, I will not attempt to describe them all here, but I think it is important to comment on a few significant ones. The single biggest improvement (perhaps second only to the speed increase) is the addition of a volume control. While having only 3 settings, Loud, Soft, and Mute -- this is a huge benefit. Having the older RoboRaptor guard the doorway at bedtime was impossible due to his constant loud snorting. Even without adjusting the volume down or to mute, RoboReptile seems better mannered. Guard mode is still present, and the user has a choice of either the default behavior, or a programmed series of moves if RoboReptile senses movement. The program mode is available anytime, not just in guard mode. Up to 20 moves can be programmed in. Other new features, such as "Tail Sweep" and "Wiggle" can be used in a program to make RoboReptile do a "dance". And, like tail sweep is totally cool for sending rows of toy soldiers into havoc. (Ooops, sorry -- Momentary regression. I didn't really try that -- Really -- I didn't.) Unfortunately, the programmed moves are lost when RoboReptile is powered off. If RoboReptile is powered off, or goes into sleep mode he cannot be awakened from the remote. RoboReptile also seems to suffer from narcolepsy in low lighting. RoboReptile comes with a plastic face shield that covers his eyes and head. This makes the robot lethargic, and after a few moments undisturbed in this mode, he will go to sleep. The problem is that in anything but a fairly brightly lit room, RoboReptile may think his hood is on. I am not quite sure what the intent of this whole hood thing is, and it is certainly a "feature" that could have been left off. Many features of RoboReptile feel like they should just be an update to RoboRaptor. Given the choice, RoboReptile is a much better value than RoboRaptor, however RoboReptile still lacks sufficient sensors, intelligence, and personality to be a true interactive entertainment robot. Limited Human Interaction - Can't play with or pick up anything.